I came across this miracle fruit about 10yrs ago at an eatery in Notting Hill – London. The very time I had this in a salad, it was yummylicious. So of course as a curious personality, I got it on a Sunday and tasted it raw. I must say – it was tasteless. So I mixed it with onions, green chillis, tomatoes, chickpeas, and some Maggi masala and scoop – we had a desi guacamole. I got hooked and since then I cannot get over this wonderful fruit / or a single seed berry! I ate it raw with some salt, black pepper, sliced, crushed, smashed, in a smoothie and pretty much in any and every form I can! Even though it’s tasteless once mixed with any other items, it absorbs and enhances any dish, meal or cuisine. 1. Avocados have about 35% more potassium than bananas. One cup of cubed avocados (150 grams) has 727 milligrams of potassium compared to one cup of sliced bananas (150 grams) with 537 milligrams of potassium. 2. Avocados are high in fiber. One cup of cubed avocados (150 grams) has 10 grams of dietary fiber – 40% of the recommended daily value. 3. Avocados are really a fruit – in fact, botanically they are classified as a berry with a large seed. 4. Avocados have goofy nicknames. In other parts of the world, avocados are referred to as “alligator pears” due to their shapes and bumpy, green skin in Spain and Mexico, as well as “butter pears” in India and China. 9 Avocados are not so great for pets. The leaves, skin and seed (or pit) of an avocado can be toxic to cats, dogs, birds, cows, goats, guinea pigs and horses if eaten. 13. Avocados may help to lower bad cholesterol. A study published in the Archives of Medical Research found that patients who ate a diet rich in avocados had a 22% decrease in bad cholesterol levels and an 11% increase in good cholesterol. 14. Avocados may cut the risk of metabolic syndrome. Diabetes, stroke and coronary artery disease are often classified under a group of symptoms known as metabolic syndrome. A study published in the Nutrition Journal showed that eating avocados reduced the risk of metabolic syndrome and improved nutrient intake. 15. Avocados may help to prevent cancer. Carotenoids are antioxidants that help to protect against certain cancers. California-grown avocados contain 11 carotenoids and the highest concentration of carotenoids are in the dark green, outer flesh of the avocado closest to the peel. Since my obsession with avocadoes has been a long lasting affair – I could not resist to visit Avocaderia where everything revolves around Avocados. I havent heard a better news in a while! So, Here I was! Hungry & Excited. I want to try everything on the menu. The menu is compact, clean and basic. Nothing over the top. Set up in a cafeteria style and they serve on paper plates. You can mix and match between burgers, pizza. beer, fried, ice cream, avocados sushi, kababs and dumplings to fresh handmade vodkas to the oldest factory of chocolates. There are many innovation hubs and all these options can make me stay here all day. Their menu change as per upcoming seasonal change, supporting a healthy lifestyle and have a team that makes the most colorful open sandwiches with Avocado! Few other places that caught my attention at Industry City! Designer Furniture Outlets! Definitely worth the visit. And the view is not bad too! Innovation and Thinking hubs – I love such spaces! Li-Lac chocolate factory since 1923. I was pulled by a strong force of chocolate tingling smell of fresh chocolate and roasted nuts. I ended up tasting variety of chocolates and learning that they Li-Lac makes the most variety of chocolates in the USA – more than 120 items! Chocolates are still handmade and in small batches for freshness. I must mention speaking to one of their most senior staff who has been making chocolates for them for 28 years and has only gained a pound in this years-I definitely envy him but his passion and dedication was worth the time. Plus I got to see so many chocolate sculptures for every holiday. Fact: All you need is tempreture control to maintain these sculptures and they can last upto a year! Burger Joint Proves the fact – If your food is good – you do not need anything else! Fries get a special mention! And if you have not tried – You must visit their branch in @Le Parker Meridien. Famously known as a hole in a wall – It is quite a famous joint in Midtown. PS: One of the first burger joints I tried when I moved to New York! So if you need a place where you can be part of the crowd or catch a corner and get to enjoy all these food throughout the day – Industry City is for you. And if this is not a kind of day you want to spend – you can come for a meal or two and head back to the #yourdayyourway. 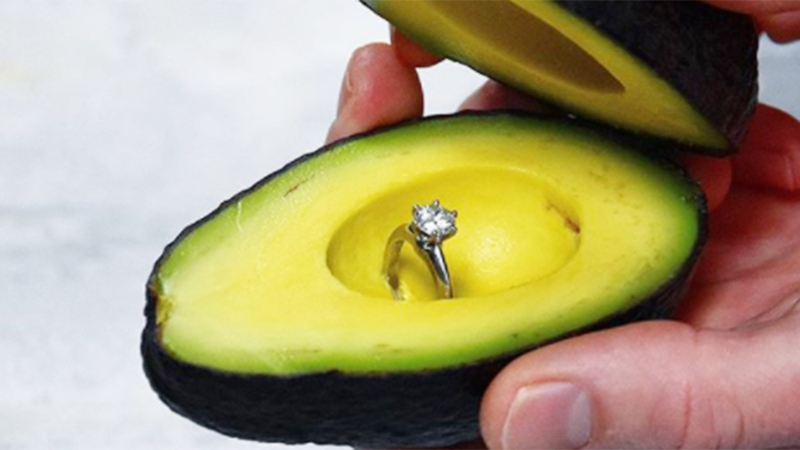 Wishing you and Avocado a smashing life together!!!! Check out 50+ easy receipes with Avocado here – this will keep your relationship light and healthy. Thank you for all the love, honest comments and loyalty of reading the blogs! Next Post Conversations with Cocktails!